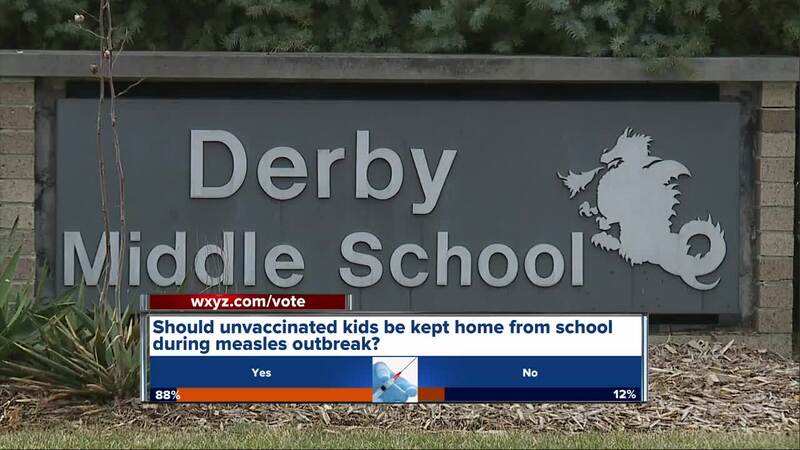 BIRMINGHAM, Mich. (WXYZ) — A student at Derby Middle School in Birmingham has been diagnosed with measles, according to a letter sent home to parents from the school district Sunday. The virus has been spreading through counties in metro Detroit after a travel-related case of measles was confirmed by health officials in mid-March. The Oakland County Health Department has shared with us that there was a confirmed case of measles at Derby Middle School on Friday, March 29. We are following guidelines from the Oakland County Health Department, which includes the exclusion of students that are not vaccinated or under vaccinated. In the case of measles, the exclusion period is 21 days from the date the exposure occurred. The health and wellbeing of our students are top priority and we are adhering to health guidelines set by our county and state. We look forward to the return of all of our students as quickly as possible. The Birmingham Public School District is working with the Oakland County Health Department in regards to the outbreak. There are now 39 confirmed measles cases in southeast Michigan, according to the Michigan Department of Health and Human Services. It is the highest number of cases in Michigan since 1991.